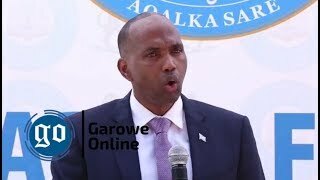 GAROWE, Puntland - The governor of Nugal region, Omar Abdullahi Farole survived being by Police chief of Somalia's northeastern semi-autonomous region of Puntland, Abdulkadir Farah Shire (Ereg) in Garowe city, Garowe Online reports. 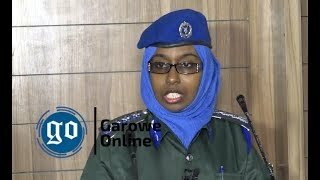 Reports reaching GO's news desk indicate that the shooting took place at Jubba hotel in the downtown of the state capital, Garowe on Saturday evening during a high-level security meeting to discuss region's stability and the threat of terror groups. 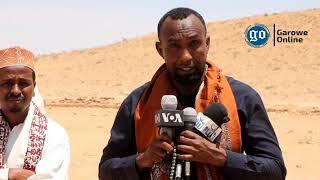 The conference was present by Minister of Security, Nugal regional governor, Commander of the Counter-terrorism, the Police Commissioner and his deputy, with reports that a dispute broke out between the officials before Gen Ereg fired a hail of bullets. 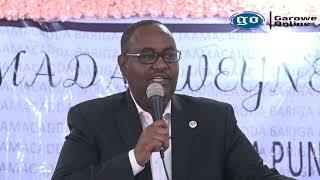 Bile Farah Ali, the deputy Police boss of Puntland state has sustained gunshot wounds to the leg and he was rushed to Garowe general hospital to receive medical treatment. "After a dispute, General Ereg picked his pistol and tried to shoot Nugal governor in the head, but the bullets struck Ali's leg," said a senior Police officer, who asked not to be named told GO over the phone. The security conference has ended in dispute and chaos, he said. 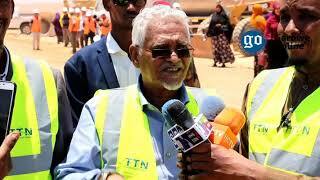 Meanwhile, Puntland government is yet to comment on the incident. 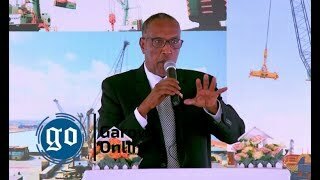 Last year, former Puntland security Minister, Abdi Hersi Qarjab, and five soldiers were seriously wounded in a shootout between Police and Paramilitary Birmadka forces in the outskirts of the state's commercial and port city of Bosaso.